Why bother replacing your pads? Obvious really, but knackered brakes can put you in a hedge. Pad wear is inevitable and, on top of gambling with your safety, worn out pads will also wreck your discs and can end up costing a small fortune. Besides, regularly checking your pads takes just a few seconds and changing them yourself is pretty simple and will save you some cash. How can I tell if they need changing? Most brake pads have a wear indicator groove moulded or cut into the surface, so even those of zero mechanical nous can tell. Once the pad is worn down so much that this groove disappears, or the pad itself is down to about 2mm, you’ll need to whack some new pads in. Good spanners, sockets or Allen keys of the correct size to fit the caliper retaining bolts; some brake cleaner spray; a rag or old toothbrush; a large flat-headed screwdriver, some copper grease; a couple of bungee cords; a torque wrench, a pair of pliers and some brake fluid (of the right grade). If brake pad wear is neglected and not checked regularly the pad material will eventually completely wear away, leaving the metal pad backing plate acting on the disc. Braking power will be hugely reduced, the brake discs will be scored (and will probably need replacement) and in extreme cases wear can cause a bike/wall interface, which you really don’t want. When it comes to changing your pads it’s important to remember poorly maintained brakes often corrode, caliper retaining bolts can seize, as can the caliper pistons – trying to free these off with the wrong tools can muller them. Can you turn a spanner and do you own a half decent toolkit? Good, then you can do this job. You also need time and patience, so allow at least two to three hours. 1. Most modern bikes have two front disc brakes and their pads should be renewed at the same time. 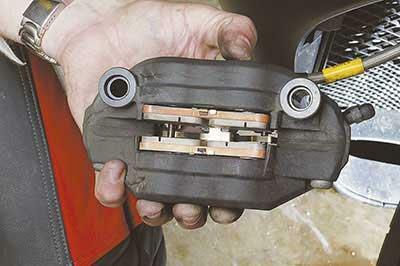 Buy new pads for each caliper (usually around £20 a pair). Sintered pads (with metal embedded into them) usually give better braking, while pads with a ceramic backing are designed to stop heat reaching the brake fluid. 2. 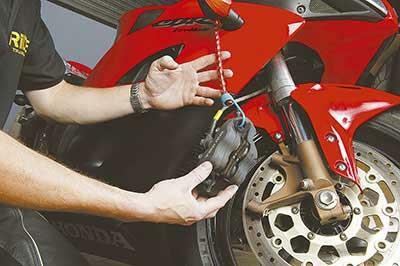 Loosen any pins or screws which may be holding the old pads into the caliper before you remove the caliper itself from your bike – you’ll find it easier than struggling to undo them when the caliper is loose. But don’t fully remove the pins at this stage. 3. Loosen and then remove fully the caliper retaining bolts. Be careful not to let the caliper dangle on its brake hose. Either tie it up with a bungee cord or hold the caliper in place with just one loose bolt if you need to leave it. Don’t disconnect the hose or you’ll need to bleed the system, which is time-consuming and best avoided. 4. Using pliers, remove any pins, clips or ‘R’ clips which are holding the old brake pads in position inside the caliper, pull out the pads and check they are the same type as your new set. 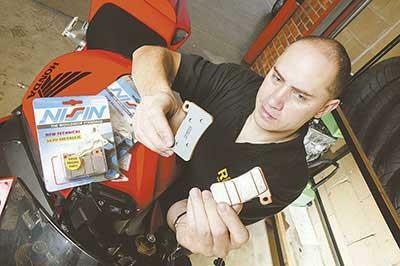 Carefully store any parts you remove, such as anti-squeal shims, as you will need them when you install the new pads. 5. 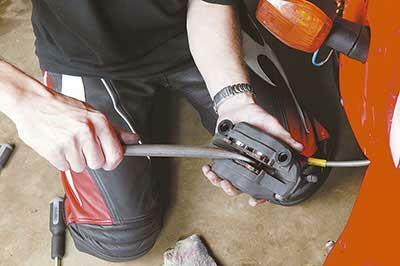 Gently operate the front brake lever so the pistons move slightly out of their bores. Do not pump the lever or the pistons will be forced too far out. They are difficult to push back in and you will then need to bleed your system. 6. 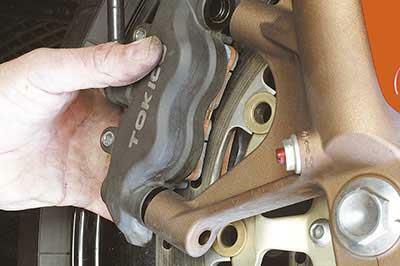 Clean your caliper with spray cleaner and then rub it with a cloth or old toothbrush. Pay attention to the exposed ends of the pistons. They should be as sparkly as the ones above. 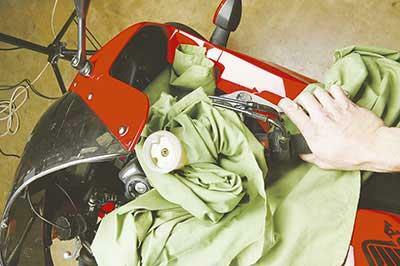 Then place a cloth around the fluid reservoir on the bars. Clean and remove the cap and rubber diaphragm. Wipe away any trace of moisture from them. 7. 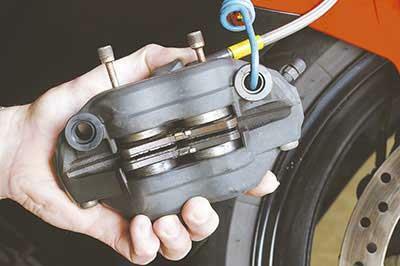 Using firm hand pressure, push the pistons back into the caliper and check that the fluid reservoir does not overflow. You can also do this by re-inserting the old pads and then using a large screwdriver as a lever. 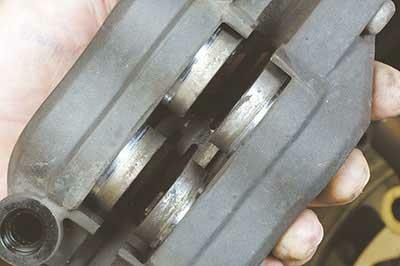 Be careful not to damage the pistons and check that, when pushing one piston in, the other is not forced out. 8. Smear copper grease on the back of each pad to help stop brake squeal. Clean any pins and apply copper grease. Put the pads in and replace clips/pins. Ensure the friction material faces the disc and there is space between the pads for the disc. Check all the bits you took out in 4 are replaced in the same position they came out. 9. 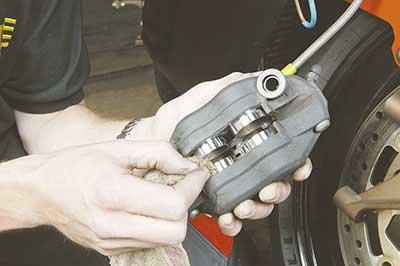 Slide the caliper over the brake disc, ensuring that one pad goes either side of the disc and that the pads remain in their correct positions. Replace the caliper bolts using a smear of copper grease on the non-threaded part of the bolts and tighten to the correct torque. 10. 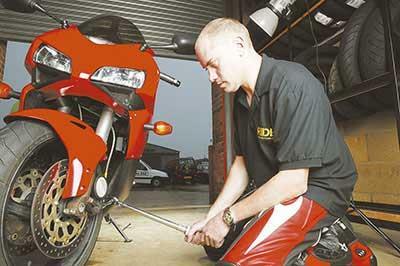 If your bike has twin front discs, go to the other side of the front wheel and repeat steps 2 to 9 for the other caliper. 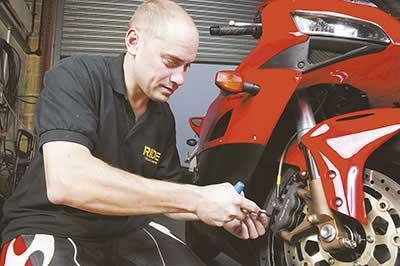 Re-tighten any pins to the right torque, reposition any ‘R’ clips and replace any dust caps. Don’t let your greasy hands contaminate the pads and keep an eye on the fluid level in the reservoir. 11. Pump the brake lever to re-adjust the pistons to the pads. This may take several pumps. Keep going until the lever pulls back a ‘normal’ amount for road braking then give one final firm squeeze. Take care as you’ve still got the reservoir lid off and brake fluid is highly corrosive and can strip paint. 12. 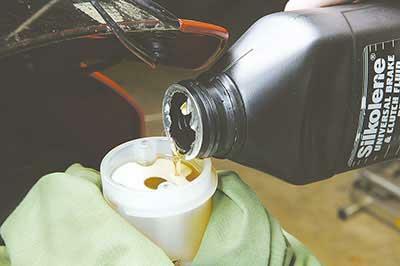 Top up the brake fluid reservoir to the maximum mark if necessary and refit the rubber diaphragm and cap. Well done, you’ve changed your pads. But remember, go easy on them for the first 50 miles or so (unless you need to do an emergency stop) to allow the pads to bed in and start working at their best.